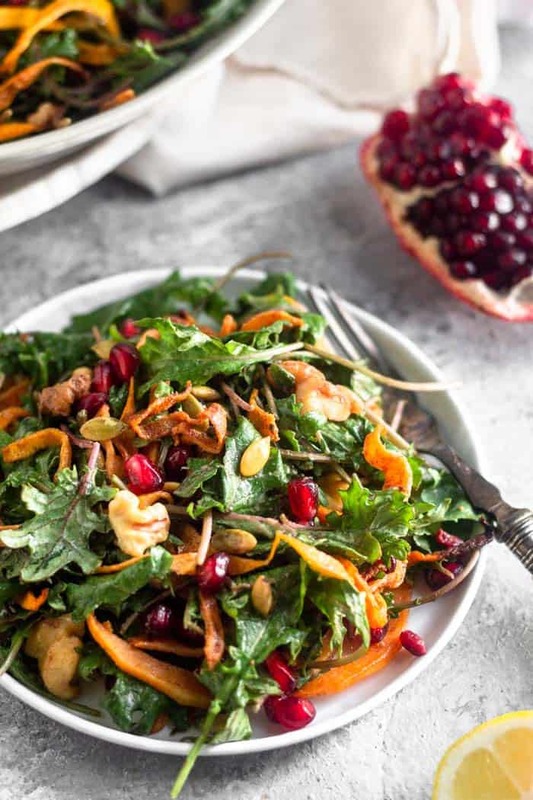 A simple Kale Salad with Butternut Squash & Pomegranates that is delicious and beautiful! 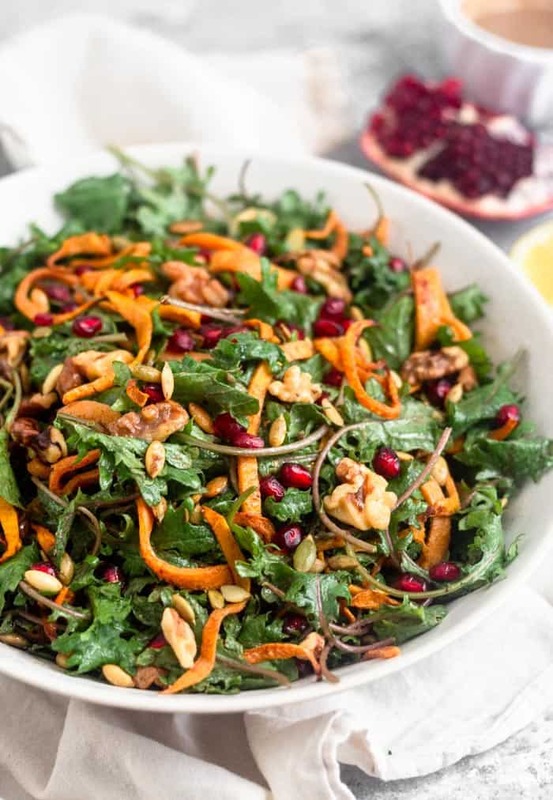 Loaded with kale, butternut squash, pomegranates, nuts and seeds, and a creamy tahini dressing! 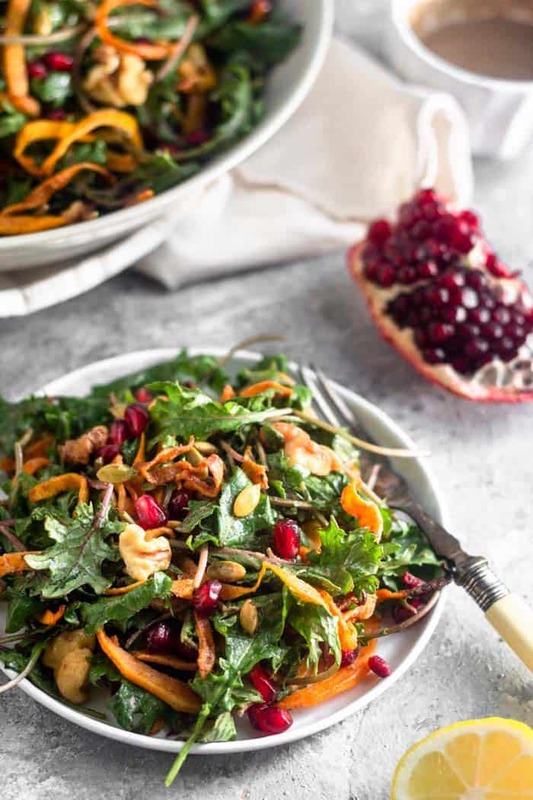 I know it’s December and all y’all are all about the baking, Christmas cookies, and holiday treats (stay tuned for those next week), but what’s a holiday dinner without a pretty salad?! At least in my family we always have a a good salad with most meals. And the holidays are no different, except we make them a little prettier. 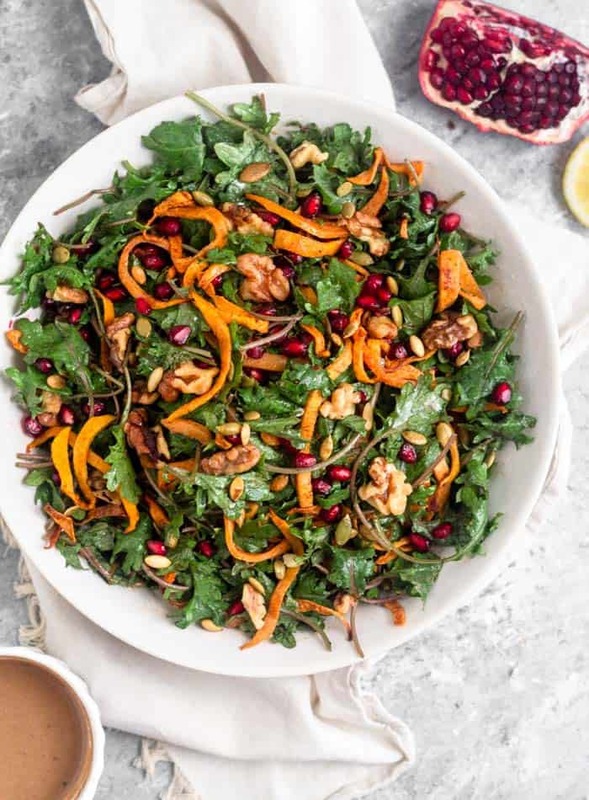 So today I’m sharing one of my favorite traditions with you guys – this kale salad with butternut squash and pomegranates! I’m pretty much a salad connoisseur and don’t do boring salads. 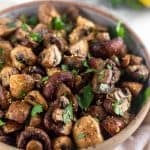 They need to be flavorful, packed with different ingredients and textures, and have a good dressing. 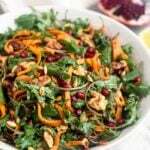 For example, this roasted carrot salad is one one of my favorites (and also great for holidays)! 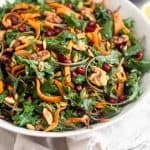 I’m happy to say this kale and butternut squash salad hits on all those notes as well! 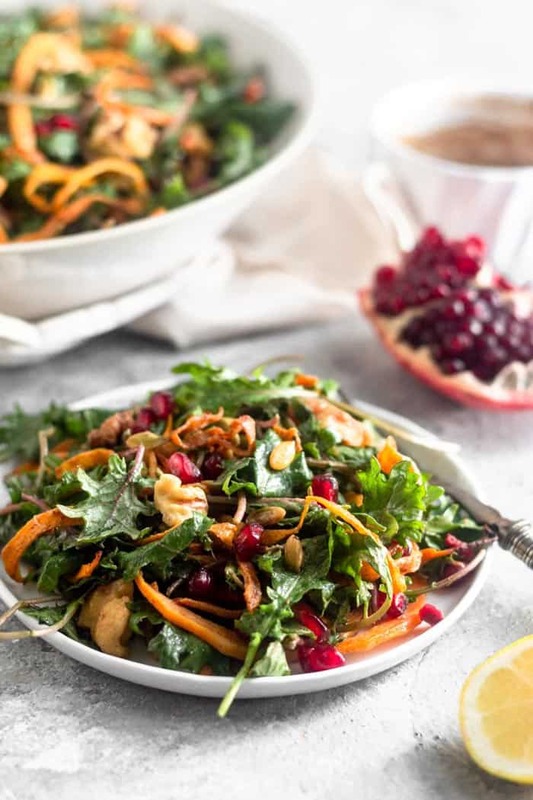 It has roasted butternut squash, crispy nuts and seeds, juicy pomegranate seeds, and a creamy tahini dressing! 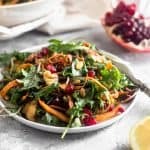 To be honest, this salad does take a little bit of prep time as you need to spiralize the butternut squash (or buy them already in noodles to save time like me!) and then you need to roast them. They take about 25-30 minutes to get a little crispy, but while they are cooking, you can assemble everything else. Add the rest of the ingredients to a bowl and make the dressing in a small jar. Then once the butternut squash noodles are done, all you have to do is toss it all together and serve! 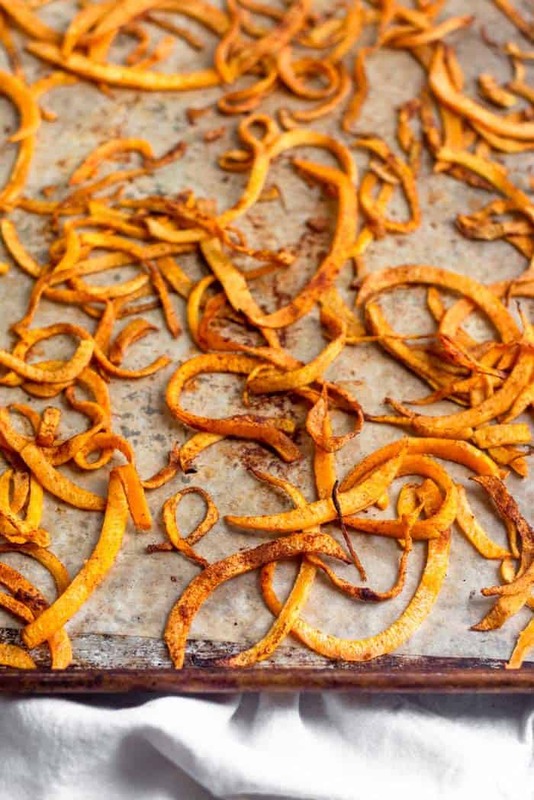 To help save time, you can roast the butternut squash noodles ahead of time. Store them in the fridge for a few days until you are ready to assemble. Same goes for the dressing. Depending on what brand of tahini you have, it might harden a little in the fridge, so just give it some time to come to room temperature, or add some water to thin it out some. When it comes time to serve, just add the remaining ingredients to a bowl and mix it all up! I would wait to dress the salad until a few minutes before serving so the nuts and seeds don’t get soggy. To make this salad a full meal, you can add whatever protein you like – grilled chicken or shrimp would be delicious, but anything goes! Also chickpeas would be great if you don’t eat meat. You can also divide it in half instead of 4 for a more satisfying meal. Preheat oven to 375 degrees Fahrenheit. Toss butternut squash with oil and cinnamon and place on a parchment paper lined baking sheet and bake for 25-30 minutes until crispy. When there are 5 minutes left, place walnuts and pumpkin seeds on another baking sheet and roast for 5 minutes. Salt nuts and seeds when they are done. 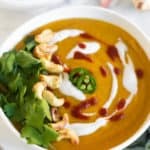 While the butternut squash noodles are baking, in a small bowl add all the ingredients for the dressing and whisk to combine. Add some water if you want a thinner consistency. Set aside. Once noodles and nuts and seeds are done, add all the salad ingredients to a large bowl. 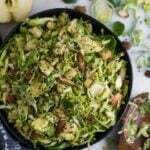 Toss with the dressing and enjoy! 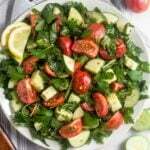 Such a great salad. I made this for a work potluck. Everyone loved it!!! Never would have thought of putting butternut in a salad but it was so good! That makes me so happy! So glad everyone loved it! Thank you for trying it!